It is a surprising fact that over 60% of all Americans complain of insomnia, or trouble getting a good night's sleep. This affects both men and women. Some people may not even know they have insomnia. Many times I hear patients say that they do not have insomnia but at the same time they also say they get up in the middle of the night once, sometimes twice, to go to the bathroom. Unfortunately, that is an example of insomnia. Unless you are able to get to sleep as soon as you go to bed AND sleep at least 6 hours without interruption, you have insomnia. I mention 6 hours without interruption. I have been asked what is the correct number of hours a person is supposed to sleep. The answer is that it varies from person to person. The most common amounts range between 6 and 10. Most adults know how much sleep they need to feel rested. It is the amount of sleep that is needed to rejuvenate and repair the body during that time period. Because the digestive system is not in high demand while you sleep, most of the cellular repair can occur. There are a number of common contributors to sleep disorders: stress, bladder or kidney disorders, odd work schedules, eating a heavy meal right before bedtime, incorrect diet for your particular body's needs, uncomfortable mattress, and caffeine, alcohol, or nicotine use late in the day. Some patients often take strong prescribed sleeping pills. Be aware, however, that drugs are not a cure for the underlying causes of insomnia, and can be dangerously addictive. And did you know that some medications for other types of ailments actually cause insomnia, such as high-blood pressure medicine, and many decongestants and antihistamines, for example? Even so-called natural remedies such as melatonin and valerian root should be taken only under supervision, as these too can cause possible reactions. However, for those of my patients who have trouble sleeping, and feel they have 'tried everything', I have found something that works extremely well. Rest Easy: A Drug-Free Solution! Sleep Release is a special product combining Chinese herbal components and all-natural ingredients. This is a very wonderful product! Call 727 449-8080 and order your Sleep Release today, or click the "Order Here" button at right to order right now! "Drugs are not a cure for the underlying causes of insomnia, and can be dangerously addictive." "I was having trouble getting a good night's sleep for some time. My sleep was interrupted and erratic and I was not getting sound sleep. Therefore I never felt fully rested which affected my overall health and well being. When I began taking Sleep Release, this pattern changed. I now sleep soundly and my sleep is not interrupted. I don't have anymore worry or anxiety over this problem. I wake up in the morning feeling well rested and alert which has made it possible for me to feel better all day long. I get more done, my energy level is higher and I'm happier. I attribute these improvements to the fact that I am able to sleep soundly for a sufficient number of hours each night. It's really great!"  M.F. "I wake up in the morning feeling well rested and alert... "
"Dr. Decuypere prescribed an excellent supplement for me that has been extremely helpful in sleeping through the entire night." S.G. "I've had just about every kind of sleep problem there is for the last 10 years. Sometimes I couldn't get to sleep until almost dawn. Other times I'd go to sleep early and wake up in the middle of the night, unable to sleep. I could sleep 10 hours and be exhausted, and rarely I would sleep 7 hours and feel great. I'd wake up 3-4 times in the night uncomfortable and go to the bathroom just because it was the only thing I could think to do. I'd wake up at 5:00 a.m. in the morning with a headache. Couldn't sleep on my back because of the ache. Couldn't sleep on my stomach because that was "the worst way to sleep". Mostly would sleep on my right side but then that started to hurt. If I'd be in bed too long I'd get a headache. I tried exercise, aspirin, melatonin, valerian root, calcium drinks. I tried not eating at night and I tried eating at night. I tried diets to get the blood sugar normalized. I had acupuncture and adjustments. I'd watch TV, read books, even work, all to get to sleep and all to no avail. I researched beds and spent good money on different beds. I bought air filters for the whole house and for the bedroom. I got the mold out of the master bath and added negative ions to the air. And, I'm sure that's not a complete list. Sleep was a mystery. 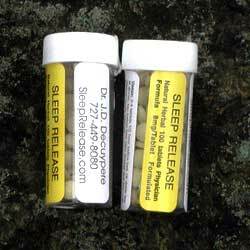 Then Dr. Decuypere recommended Sleep Release. From the first day my sleep improved. I slept 8 hours, getting up only once in the night, but going right back to sleep. In the morning I was comfortable and didn't need or want to get out of bed, compared to most mornings when I'd get out of bed because I was so uncomfortable I didn't want to stay there any longer. Since starting with Sleep Release my dosage has decreased while my sleep has remained good. It's an amazing product and I recommend it to anyone who has any sleep problems!" R.W. "From the first day my sleep improved." "As I got older and am now in my 50's, I noticed that I slept lighter and lighter as the years wore on. I also woke frequently to urinate (3 times a night was normal). Even though I go to bed early, to make up for waking up so often in the middle of the night, I would wake up early and be unable to return to sleep. This constant 'not enough sleep' continued to wear away on me and effected my energy level during the day, as you might expect. I started taking Sleep Release about 2 months ago and noticed a very real difference the first night. It didn't make me sleepy but I went to sleep promptly and I sleep so deeply. I also slept much longer - and for the first month slept consistently for about 9 hrs or more a night. I think this was because I was so sleep deprived. I only get up once a night to urinate and go back to sleep promptly. Now in my 2nd month of taking this, I consistently get 8 hrs per night. I only take 1/2 pill per night so the little jar of 100 pills will last a long time! I have recommended this product to all my friends and family and everyone raves about it. My Mother takes them for her high blood pressure and the improved sleep is a real bonus. She is now completely off her medication as the Sleep Release returned her BP to normal within 24 hrs."  R.L. "I have recommended this product to all my friends and family and everyone raves about it." "Over the last few years I've noticed it has been taking me longer and longer to get to sleep at night. Especially when stressed, I will sometimes toss and turn for an hour or two before finally getting to sleep. Sometimes I've given up, gotten up and read a book or worked on some project in the middle of the night. I wasn't getting enough rest, even though I was spending more time trying to rest. For the last month Sleep Release has made a big difference. When I remember to take it about half an hour before bed, I drift right off. If I take it just before bed, it takes half an hour to kick in - then I go to sleep. If I forget to take it, I'll find myself tossing and turning a couple of hours later. And there have been no noticeable side effects. "It's great to wake up refreshed!" "Sleep Release has been very helpful. I've used many other sleep remedies but they either didn't work or left me with a 'hangover'. Sleep Release does a great job without the hangover. "Thanks to Dr. Jeanne Decuypere's discovery that 'Sleep Release' would benefit me, I have been getting a good nights sleep for the first time in 18 years!